Changeling's Year of the Hunter book features the Autumn People, perhaps the most dangerous enemy that a changeling can face. Armed not with weapons but with their disbelief, Autumn People are the most feared foes of all. This book provides extensive information on these servants of Banality. The dreams of Concordia lie broken in the wake of the High King's disappearance. For commoner and noble fae alike, anarchy spreads across the land and threatens the very changeling world. Yet those who believe that the worst has transpired now recognize a new threat: The gates of Arcadia swing wide once again. The five sidhe houses left behind in Arcadia return to the mortal world and find a war-torn land ripe for conquest. The Book of Lost Houses explores the repercussions of the Second Resurgence as a new wave of noble fae burst onto the scene, ready to take their places as saviors or overlords. Nothing remains the same. Break free from the shackles of humanity with a blast of dragon fire. Take flight with wings of bright feathers and leave the mundane world behind. Monsters are the products of imagination; theyre not real or are they? Dreams take shape in the hidden places of the world, and beyond the Earth itself. Unicorns, dragons, goblins theyre all too real. You just need to know where to find them. This kit includes a 15 page full color section containing additional guidelines for using Bunks in your Changeling game, as well as a listing of new Bunks specifically designed for each kith. These additional rules are provided to help clarify the rules provided in the Changeling rulebook, as well as to offer some alternative methods for using the Bunk system. This booklet is divided into two sections, either or both of which can be used by players and Storytellers alike. Players should consult their Storyteller before using any of these additional rules or Bunks. Changeling: The Dreaming is the game of faeries, hidden magic, strange realms and imagination, all set in the modern world. Thats a lot of stuff a lot more than we could ever hope to fit into one rulebook. The Changeling Storytellers Guide therefore fulfills every gaming groups dream no pun intended. It picks up where the Changeling rulebook leaves off and offers a plethora of new information, from rules clarifications to new and advanced systems for handling fae magic and it puts that, and more, all in the Storytellers hands. The gates to Arcadia, the original paradise, are closed. Only the world of humanity remains. Without any awareness of our true nature, humankind crushes us beneath its banal heel. Joy and laughter are gone; only the Dreaming remains. We are changelings, the forgotten ones, neither fully fae nor wholly mortal. The last of our kind on Earth, we have built ourselves an invisible kingdom. We are everywhere, yet you have never seen us. We hide, not behind some fragile Masquerade, but in plain sight with the power of our Glamour. We exist within a real world of make-believe where "imaginary" things can kill and "pretend" monsters are real. 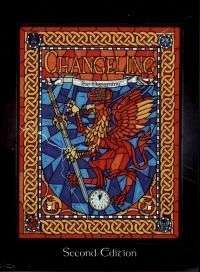 Changeling: The Dreaming is a roleplaying game. It is a beautifully illustrated, full-color book that explores the hidden world of the faerie folk trapped on Earth. It gives you rules for creating your own changeling character, and describes thesetting and history of the fae. What happens next is up to you. This booklet is a simplified version of Changeling: The Dreaming. It gives you the highlights of the Changeling setting and rules, the core information you need to play a game. Try it out. If you like it, the rulebook is available here. First they searched for the Toybox.Then they went beyond the Shadows on the Hill.Now, the journey home leads them to the Court of all Kings. You promised us, when we gave you the world to go to war, that you would remember your vows. You promised to leave our sacred places intact, to leave sacrifices for us, to remember us in your songs. You promised that when the War of Seasons ended, you would stand aside for us, the true rulers of the world. You lied. Freed from the Darklands of the Dreaming, a host of Dark-kin stalk the waking world. Pursuing their own mysterious quests, creatures of ancient nightmares and recent terrors travel strange new paths of dark enchantment, weaving their seductive lures and horrific visions into the fabric of changeling society. The Dreaming will never be the same. Denizens of the Dreaming catapults Changeling: The Dreaming into a darker dimension, providing players and Storytellers with rules for playing the Dark-kin. Discover new Abilities, Arts, Merits and Flaws and explore the history of these enigmatic creatures of dark imaginings. This guide takes you from the Near Dreaming to the far reaches and unexplored regions of the Deep Dreaming. Includes new chimerical creatures and new rules for the effects of the Dreaming, plus fantastic adventures that steer you through dangers in this ever-changing land. Freeholds, concealed by their Glamour from the eyes of mortals, are places of splendor that dot cities and countrysides across the Earth. Any site where changelings gather may become a freehold, ancient glens containing natural wellsprings of Glamour still exist today. Enter a Realm of Fantasy! Freeholds and glens are fonts of Glamour, places where wondrous and magical effects are commonplace occurences. Enchantment here is powerful: few can long resist the lure of these small islands of wonder. Ireland - the heart of the Celtic myth and legend. Here is a land divided by petty kings, a land of ancient mysteries and of powerful magic. And most sought after of all is Silver's Gate, the last gate to Arcadia - rumored to be hidden somewhere along the islands rocky shores. The Immortal Eyes trilogy has spanned the globe, from San Francisco, to Hawaii, and now finally to Ireland. Court of all Kings is the final installment in the Immortal Eyes trilogy. Welcome to Hawaii, one of the world's natural splendors. From its glittering waterfalls to its firey volcanoes and black sand beaches, Hawaii is considered to be one of the most beautiful places in the world. Hawaii has long been a haven for Kithain seeking to flee the ravages of Banality. Here can also be found the native Menehune changelings intent upon keeping their islands free from the encroaching Banality. Welcome to San Francisco, site of the resurgence of fae on Earth. This city is perhaps the most important to the fae, for the Glamour is more powerful here than any place on Earth. No other city contains more freeholds and magical sites than the Shining City. During the Age of Myth, everything in the world was born with the capacity to dream, therefore, everything possesses - or possessed - the potential to be alive. Although they world has changed since its beginning and may parts of it have forgotten how to dream, some fugitive elements still remember. These vessels of the Dreaming endure in the hidden corners and secret corners and secret enclaves of the world, remembering as best they can the lost days when every waterfall could talk and every tool was alive. They are the Inanimae, the last children of the Great Slow Empires that now sprawl across the Earth in mute, immobile ruins. Even to most of the changelings, they are a myth too fantastic to have survived. This book sets the stage for dramatic changes coming for the Changeling world. With High king David missing and presumed dead, the political factions of the fae play a deadly game of cat and mouse for control of the throne. Born from the dreams of wanderers and storytellers, eshu follow their own enigmatic traditions, keeping alive the spirit of adventure and the desire for freedom. Though counted as commoners, these embodiments of the dreams of Africa, India and the Middle East claim a lineage as royal as the noblest of the fae. Yet all too often, they have reputations as irresponsible roamers, tricksters and thieves. What secrets do the eshu conceal? What drives them to a life of constant wandering? Although nocker creations are highly prized among the kingdoms of the Kithain, most changelings bear little love for these dour and foul-mouthed tinkers. So brusque is nocker personality that few take the time to get to know them. Yet, those who are willing to do so discover that underneath all the hurumphing is a soul as passionate as a satyr's and a heart as stout as a troll's. Kithbook: Pooka features A complete look at pookas from their ancient origins to the modern day; An inside look at the culture and behavior of nockers; New Merits and Flaws for pooka characters. Driven by humanitys most primitive dreams, redcaps exist within a blood-red nightmare of insatiable hunger. Wherever they go, their destruction and terror leave a trail of broken bones and ravaged hopes. Despised by the other kith, feared and hated as figures of uncontrollable savagery, redcaps glory in their dark reputations and darker desires. Or do they? What lies behind their brutal energy and vicious practices? It is for these things that trolls stand for above all else. Silent and strong, the trolls are often looked upon as the protectors of fae kind. They seve the sidhe as warrors and knights, never questioning their place in Kithain society. Yet some say it was not always so... once it was the trolls who ruled the kingdoms of the fae, and some say they will yet again. For now the trolls continue their silent vigil - watching... waiting. In ancient times, the fae of China served as the messangers and servants of the spirit world. In those days, they traveled freely between the realms of spirit and flesh. They were the emissaries of nature, the guardians and protectors of the sacred places. The hsien (known as changelings in the West) are the descendants of beings who were trapped in the realm of flesh during the Mahakala(or the Shattering). Divided by both form and court, the hsien struggle to survive in a world of mortals who have turned their back on the realm of spirit, a world full of other supernatural beings who would destroy them. Since the Mythic Age, the noble houses have been hailed as the leaders of the fae. Though most know only a little of these houses, few truly understand them. Finally, Barn Edgewick, scribe to High King David, has assembled a discourse on the five most powerful houses of the Seelie Court. These pages are a complete dissertation and serve both as a primer for those fae new to a house, as well as offering an insider's look at the inner workings of noble houses. This book offers an inside look at the five most prominent houses of the Seelie Court: Dougal, Eiluned, Fiona, Gwydion and Liam. Within you will find the complete histories and cultures of each house as well as its views on the other houses and the commoner kith. The Changeling Players Guide is an essential reference for players and Storytellers alike. By expanding the possibilities of the fae, and introducing a whole new culture, the Changeling Players Guide reveals a font of new possibilities for creative roleplaying. Herein you will learn new secrets behind the origins of the nine kith. Discover the 13 kith of the Nunnehi Nations. Delve into the secrets of new Arts, and explore new Legacies and Backgrounds available to all Kithain. With the disappearance of the High King, a chill of Winter spreads across the land - now is the dawn of the Unseelie Court! Once the Courts traded rulership - Seelie ruled the summer months and the Unseelie the winter, but since the Shattering the Seelie have reigned supreme while the Unseelie patiently waited. With David Arty gone, Winter has begun to set in and the noble houses of the Unseelie Court prepare to take their proper places as the rulers of the land of Concordia. All Hail Discordia. Deep in the backwoods of the southern Appalachian mountain range, the Garou hold out against the imminent destruction of their homes. The modern world intrudes harshly onto their sacred sites, building roads over spirit paths. The Wyrm burrows into the hearts of their Kinfolk and the Ways are forgotten. But the Garou are not alone against their enemy: The native fae have been here longer, and they will not let their freeholds fall to corruption. It's a battle of backwoods wisdom and lore against an industrial society gone mad. Tear aside the veil and learn the secrets of the sinister Shadow Court. But beware! The Unseelie do not take kindly to those who would pry into their affairs. They were changelings, faerie spririts trapped in mortal flesh. They were six oathmates, sworn to each other and to the completion of a quest. Together they would search for four powerful faerie treasures that would open a lost gateway back to their timeless home, the land of the Dreaming - the land of Arcadia. Their travels take them from San Francisco to the islands of Hawaii, where the mysterious menehune - the faerie spirits of the Pacific isles - hold secrets long forgotten by their western cousins. Sometimes mortals, fortunate or unfortunate, are chosen by the Dreaming to be a part of the world of enchantment. Some bear fae blood, though they are not changelings, and some are brought in under the spell of Glamour. However they come to the Dreaming, these people will never be the same. This book offers a wealth of information on how changelings interact with the rest of the world - from mortals to supernaturals. Here are uncovered the secret alliances of the fae and the Prodigals as well as their ties with mortals and the magi. Vampires and werewolves have had their turns. Now it's time for the Kithain to take the stage. Here are complete rules for playing live-action Changeling with Mind's Eye Theatre. These are all the rules for both faerie courts and the character races. You get Merits and Flaws galore, plus rules for chimera, the enchantment of mortals and for everything else you need to bring the world of Changeling: The Dreaming to life. It is just another cheap antique. But to faerie eyes, the trunk sitting in the corner of The Toybox Coffee Shop radiates an unmistakeable Glamour that marks it as a magical treasure. It is the key to a powerful plan, which could destroy changling society... forever. They were an unlikely group of companions: a waitress, a con-man, a street performer, a tramp and two children. Their only common ground was the sanctuary of The Toybox Coffee Shop, a haven where they could drop their mortal guise. But together, these changelings in disguise would form a band of heroes sworn to stop Malacar, former wizard of a faerie duke's kingdom, from obtaining the magical talisman and using it to wreak his vengeance.